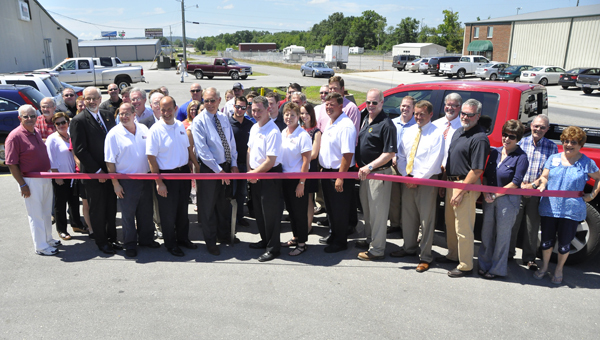 Valley Rubber in Falkville is adding 30 new jobs to work in its new 43,000 square-foot facility on Buster Road. Cronan Connell, president of Valley Rubber, said the expansion is due to adding a production line of rail fasteners for light-rail transit systems. He said the line was developed due to a partnership with L.B. Foster, which supplies transportation, construction, utility, energy, recreation and agriculture markets with the materials necessary to build and maintain their infrastructure. Connell said they would be adding four 12-hour shifts at the new facility that will work 24 hours a day, seven days a week. At full capacity, Valley Rubber hopes to produce each week between 5,000 and 6,000 fasteners, consisting of steel plate bonded into a rubber pad. Currently, production is around 3,500 fasteners per week. Jeremy Nails, president of the Morgan County Economic Development Association, said Valley Rubber did not receive any incentives to expand the company in Falkville.